They're unknown, inexperienced, short of cash, and they want your vote. 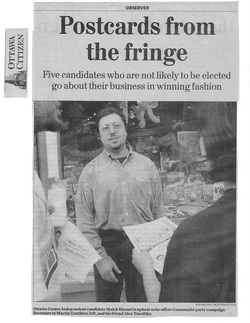 They're the "fringe" candidates. And they get no respect. I spent a full day with five Ottawa-area candidates representing the Communists, the Greens, the Canadian Action Party, the Christian Heritage Party and The Natural Law Party. Far from the TV debates and the campaign jets and the $500-a-plate fund-raising dinners, this is what Election '97 looks like. It's Saturday afternoon in the Glebe and the Volvo/Saab/Lexus crowd are out in their L.L. Bean activewear buying, enviro-friendly toenail clippers, low-sodium thumb tacks, and all-natural, fat-free, organically-grown shoe polish. At Bank Street and Third Avenue, Communist Party candidate Malek Khouri is handing out-election flyers. "Hi there!" he says to a man walking a dog only marginally smaller than Cujo. "Would you like to take a look at the Communist Party platform?" The man hesitates so Khouri tries again. "Have a look. It's something a little different." But the man isn't persuaded. "A little too different for me, I'm afraid." Khouri isn't bothered. He expects a certain amount of "subtle hostility"
"Before the fall of the Soviet Union, they used to tell us to 'go back to Russia'," he says. "At least they can't say that any more." Over the next three hours, he gives away about a hundred flyers. Of the people he talks to, half take his brochure; half turn him down. I ask him what sort of people are attracted to communism. "Young people," he says. "Students, ethnic people, workers, and creative artistic types. But especially young people." To prove his point, Khouri approaches two teenage girls walking arm-in-arm. "Hi, would you like to take a look at the Communist Party platform?" One of the girls snatches a flyer and Khouri turns to me. "See that?" he says. "She heard 'Communist' so she took it. Young people. They are the future." He tries again with a mother and daughter. He's not successful, but there is a bright side. "Did you look at the young one?" he whispers as they pass. "She waits for her mother. She has her hand out, but when her mother says 'no,' she pulls it away." We start playing a guessing game, trying to predict who'll take the brochure and who won't. An efficient-looking, woman with functional hair and genius-IQ glasses walks up. Khouri reckons she's a taker, but she brushes him out of the way. "I could be handing out money and she wouldn't take it" he says. With only ten flyers left, it's time for me to give it a try. I get three no thank-you's in a row and start to get discouraged. You need a thick skin for this kind of work. A middle-aged couple approaches. I think I can persuade them, but Khouri isn't so sure. "Tell you what," I say. "We'll go for coffee later. If these people take it, you buy. If they don't, it's out of my pocket." As they approach, I smile and make my pitch. They're not interested. "Just take a look," I say. "No obligation." They haven't taken the flyer, but they have stopped walking. "Before you vote," I say with all the sincerity I can fake, "shouldn't you consider all your choices?" They accept the flyer and I turn around to see Malek Khouri bent over laughing. "How do you take it?" he chuckles. "Cream? Sugar?." About 400 people have turned up for the Ottawa Centre all-candidates meeting at Fisher Park High School, and 399 of them have come to gripe about the Champlain Bridge expansion. Green Party candidate Frank de Jong has a position on the subject, but nobody is asking him about it. Despite Coun. Linda Davis's reminder that "there are candidates here who put up a thousand dollars. I would ask you to address some of your questions to them," nearly every query is aimed at Liberal Mac Harb, Jamey Heath of the NDP or Tory Peter Annis. "Everybody was talking about the third lane on the bridge," I say to Mr. de Jong after the meeting. "And you're the one guy with a strong anti-car platform. Yet nobody stood up and asked you about it." That's understandable," he says, "because I don't have a chance of winning. So it doesn't really matter what I say. When I said [in his opening statement] I'm against cars, I got a nice round of applause and that's all fine and good. But it's essentially meaningless because I have no chance of winning. And l accept that. But it was nice to have a chance to say it and get applause for it." At least one person is interested in what Frank de Jong has to say. Thirteen-year-old Alex Millman from Broadview Public School, where de Jong teaches history and shop stands up with a carefully rehearsed question. "What about military spending?" he asks. "Isn't the military spending around $10 billion with only $600 million going to peacekeeping?" He looks a bit young to be a ringer, but his words come right out of the Green Party's election flyer, so I ask him anyway. "Did Frank send you here?" "No," he says. "I came all by myself." I ask him what Frank de Jong is really like. "Um, he's a really nice person. He's quite devoted to the Green Party. He doesn't have a car at all and he bikes to school and everywhere." And what does a 13-year-old boy think of the Green Party? "I like a lot of their ideas. I have a pamphlet. I like their four-day work week and their carbon taxes and especially their military cuts." "If you could vote, would you vote for him?" Young Alex got a round of applause for his question, but he didn't start a trend. No one else has a question for Frank de Jong. I ask him if he is disappointed. "Oh no, not at all," he says. "This is normal. The reality is that people came to hear the big-three candidates. They didn't come to hear me. And I accept that. I'm not bitter about it. They came to hear those other candidates and that's fair enough. But one day they'll be coming to hear me." So what have you achieved tonight?" "Well I've given a couple of hundred people a chance to hear what a Green Party person says and how he talks and see if he's articulate and patient. I think that's very worthwhile." Paula Williams of Ottawa South is the only fringe candidate I met who actually thinks she's going to win. Not only that, but she fully expects her Canadian Action Party to grab 50 seats in the next Parliament. "We have 80 members running across the country," she says. "I would say we can realistically get 50 of them in. There is so much volatility and so many parties. And the more parties running, the fewer votes you need to win." At a condominium complex near the South Keys Shopping Centre she's pitching her party's economic plan to a retired man. The plan calls for the Bank of Canada to expand the money supply and "kick-start" the economy. The man isn't impressed. "It's crazy," he says. "It's a pipedream." "What problems can you foresee with it?" "What problems can you not foresee," the man replies. "I mean, for heaven's sake. How can you start up a new party and expect to get anywhere in this day and age?" "What I'm hearing is that a lot of people are ticked off and they don't know who to vote for." "That's nothing new," he says. "I've been hearing this for many, many years. It's the same thing: I don't want to vote for any of those parties. So what's the point in starting another one?" Williams thanks the gentleman for his time and leaves him with a copy of Paul Hellyer's famous comic book and one of her own election flyers. The comic book is a pretty slick affair, but the flyer doesn't even have her picture on it. They're cheaper that way. And as a single mother living on welfare, Paula Williams doesn't have a lot of money to throw around. I ask her about that. "How do you answer people who say: 'you've got two kids and you're on social assistance; what are you spending money on a campaign for?'" "I've got to get the word out," she answers. "I want to see what happens when an unemployed, single mom runs for Parliament. I'm testing the system at the same time I'm following my beliefs." "What do your kids think of all this?" "They think it's great. Because I've always taught them that you should fight for what's right and that you should never be without hope. When you have no hope, you have nothing to keep yourself going." She knocks at another apartment and an elderly lady in a pink sweatsuit opens the door. "Hello there, ma'am," Williams says, offering a brochure. "My name is Paula Williams and I'm ... ..."
They are expecting a big turnout for the Christian Heritage Party rally at the Legion hall in Hull. They've got six tables and 85 chairs, 10 gallons of coffee, 70 styrofoam cups, three boxes of cookies, 45 sweet rolls and enough cream and sugar for the morning rush at Tim Horton's. All this for four candidates, three candidates' wives, one reporter and 14 voters. But party leader and Hull-Aylmer candidate Ron Gray isn't bothered. "This is my first time speaking in public in French," he says. "So it's a good thing there aren't too many people here." He speaks in French for 10 minutes before switching to English to outline his plan to "unite and reconcile Canadians from sea to sea." Essentially, the plan calls for each individual Canadian to ask personal forgiveness for the wrongs caused throughout history by his or her "people." Gray tells a story to explain how it works. "Last year," he says, "I went to one of the Mohawk territories. I talked to one Mohawk and I said to him: 'Will you forgive me for what my people have done to your people?' And his answer was to say, 'Will you forgive us for the bitterness we have held in our hearts?" Then we embraced, and we wept together, and we prayed together, and we forgave each other." There's a lot of head-nodding going on and a few "amens." One woman cries out "Praise the Lord." In fact, this feels less like a political rally than a religious revival, albeit a sparsely attended one. More than one person has turn up with their own bible. I'd interviewed Gray a few hours before the rally and he'd downplayed the Christian angle. But here, it's a crowd-pleaser. So are family values, and Ron Gray has a plan for that too. He wants to offer parents a $1,000 monthly tax credit to stay at home and raise their own kids. We have 15 years of research that shows that institutional day-care actually harms children," he says. "Parent care is the best care. We have an entire generation of day-care kids who have not developed the ability to form an emotional bond. Those kids are time-bombs in our streets." This gets a round of applause and some more "amen"-ing, so Gray moves on to the national debt. He wants to pay it off without cutting services by simplifying taxes, cutting bureaucratic waste and phasing out grants to special interest groups. "I have this vision of the bridge of the Titanic. The water is up to their ankles and Midshipman Martin rushes up to Captain Chrétien and says 'Wonderful, Sir! We're not sinking quite as fast.' That's really hard on the people down in steerage." This gets a good laugh, so Gray wraps up his speech and everyone breaks for coffee and cake. Natural Law Party candidate Stan Lamothe is a courteous and patient man, but he's clearly a little tired of reporters who are only interested in asking him about yogic flying. "There has been too much of a focus on the outward phenomena," he says. "The important thing here is not the physical act when a person's body is up in the air, but what's happening inside with the coherence that's being generated in their individual consciousness." That's all well and good, but these folks are running for Parliament and I'd sure like to know if they actually believe they can fly. "The ancient text that describes the process of learning to fly delineates four stages," Lamothe explains. "One is where the body sits on the ground and shakes. The next one is described as the body hopping like a frog. The third stage is that they're able to walk on beams of light or moonbeams. The fourth stage is out-and-out flying." "We're at the hopping-like-a-frog stage." Lamothe and I are comfortably ensconced in a pair of overstuffed armchairs at the Maharishi Vedic College, a beautiful old heritage building in the better part of Sandy Hill. I'm trying to wrap my conventional mind around a very unconventional election platform. A central plank of the platform is those yogic flyers. "At the most fundamental level of nature, scientists have identified what's called a 'unified field,'" Lamothe tells me. "It is the source of all the creativity and intelligence in nature." The idea is that 10,000 yogic flyers, working together, would be able to tap into that unified field and spread it throughout the country. This is called the "Maharishi Effect." "Once the stress leaves the collective consciousness," Lamothe says, "people will very naturally and spontaneously act in accordance with natural law." And when that happens, most of our problems will disappear. "All we need to do is take recourse to natural law and all these problems will get sorted out." He shows me a videotape of a group of yogic flyers. It looks like they're sitting in the lotus position and flicking themselves up into the air. It doesn't look like something that could save the country. "The whole focus of the Natural Law Party is to let Canadians know that it is possible to create an ideal government. It is possible to eliminate all of the problems that Canada has. And there are proven scientific technologies to do that." Before I leave, I ask "Is there anything you would like people to know about you? Is there something you'd like to get across?" "Yes," the Ottawa West-Nepean candidate answers. "Let the people know that we're serious. This is not a joke for us."